The Systems Approach: principles A few years ago I wrote a blog post about anti-planning as an alternative to the systems approach. Part of the post was devoted to a number of principles of deception-perception. 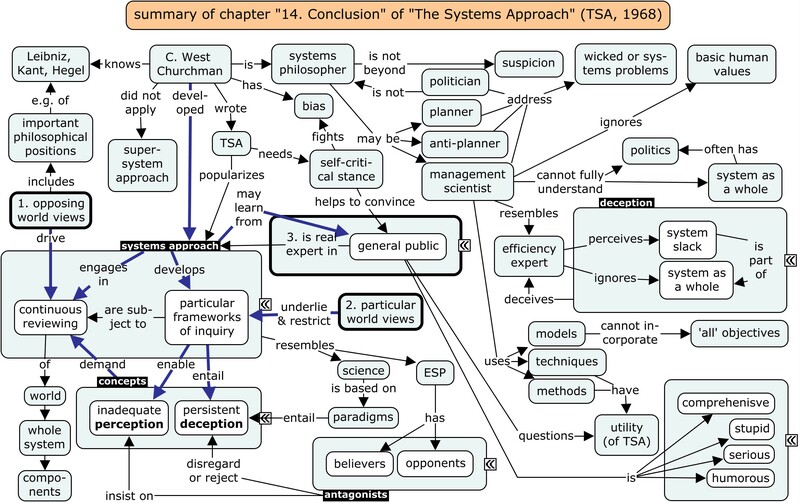 Churchman discusses their importance in the concluding chapter of The Systems Approach (TSA), which he wrote in 1968. 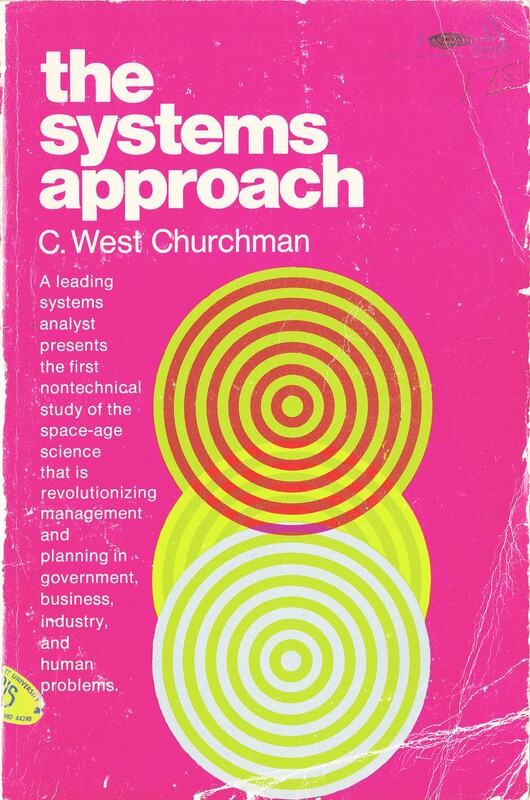 The last and fourth of these principles simply states that “The systems approach is not a bad idea.” Most people think this is hilarious, since Churchman is well-known for developing the systems approach and gave it its name. He also knew as no other that a good measure of skepticism is a fundamental necessity for the systems approach to work, even in terms of its own development. The essence of the systems approach …., “therefore, is confusion [deception] and enlightenment [perception]” (TSA, p. 231). Forty years earlier, Alfred North Whitehead, perhaps not a systems thinker, says: “Our habitual experience is a complex of failure and success in the enterprise of interpretation” (Process and Reality, 1929). Churchman’s great discovery is that we can employ the inseparable twins of deception and perception to navigate a path through the entangled messes of systems problems. The point of this blog post is to summarize how Churchman – at the time still very much a management scientist concerned with operations research – argues his case. What is the systems approach? At its most simple, I would say it is the approach of systems as a whole, both in terms of inquiry and intervention design. Here, the term ‘system’ is used broadly, meaning ‘systems problem’, ‘wicked problem’, ‘human problem situation’ etc. The trouble is that we can never fully understand systems as a whole. The systems practitioner resembles an efficiency expert, who looks at a system, perceives system slack and starts improving efficiency. He or she ignores that the system slack is part of a wider system, which may mean that improving efficiency is a misplaced effort or that it could even make things worse. By adopting the systems approach instead, the practitioner becomes aware that he or she must develop a framework of inquiry to understand the problem in its systemic context. He or she must also acknowledge that any such framework of inquiry is underlain by a particular world view, which in turn restricts the scope of the inquiry. The result of this restriction is inadequate perception combined with persistent deception. The only way forward is constant review (e.g. evaluation) of the framework of inquiry to gradually improve perception and reduce deception. The first two principles of deception-perception …. are: (1) “The systems approach begins when first you see the world through the eyes of another”; and (2) “The systems approach goes on to discovering that every world view is terribly restricted.” The second principle has been explained in the previous paragraph. The first principle is interesting, because it is what drives the reviewing of the framework of inquiry. Churchman applied this principle to the development of the systems approach as a model of inquiry by exploring the philosophers Leibniz, Locke, Kant, Hegel, and Singer as “designers of systems to produce sure knowledge”. Checkland’s summary of the systems approach Checkland (1988) writes: “The Leibnizian inquirer seeks to build networks of contingent facts, and discussion of the inquiry systems of the other four protagonists is structured by considering how they modify this model. The Lockean inquirer seeks consensus concerning the fact-net among a community of interested parties; Kant adds the dimension that we must ask also, What would be the Weltanschauung which makes this particular fact-net meaningful? Singer adds the dimension of the mood in which the inquiry is conducted. The Singerian inquirer needs the “heroic mood” (Churchman, 1971, p. 202) in which both to defend and to challenge the status quo, so engendering learning in a process which never ends.” This learning process takes the form of Hegelian dialectics. Interestingly, all these elements are found in ‘Wicked Solutions’ (Williams & Van ‘t Hof, 2014). Extra-sensory perception (ESP) Churchman compares the systems approach with science and ESP. To those people who believe in science as a producer of absolute knowledge he urges that science, including the natural sciences, is based on paradigms, which have shown to be deceptive in the past. One meaning of paradigm is ‘worldview’, which may denote a set of values or system of thought of a group or person. This suggests that the comparison with science confirms the second principle of deception-perception. Now, ESP is much more controversial than science, which results in two camps, that of believers and that of opponents. The antagonism between the two is such that both reject the idea that they are deceived and insist that their perception is without fault. Both camps refute equal relevance of each other’s’ position, which blocks serious debate and progress. The third principle of deception-perception … is: (3) “There are no experts in the systems approach.” What’s more: “The real expert is still Everyman, stupid, humorous, serious, and comprehensive all at the same time. The public always knows more than any of the ‘experts,’ be they economists, behavioural scientists, or whoever; the problem of the systems approach is to learn what ‘everybody’ knows.” Churchman also speaks of “the ideal of a unified decision maker, client, and designer” (1971, p. 204), where the ‘designer’ can be equated with the ‘expert’. The great advantage of the general public over the expert is its comprehensiveness and lack of bias as result of the abundance of perspectives. Often the public is also the client, experiencing the results of the work of the ‘experts’, while as a voter it also oversees the decision maker. Thus, in a way, the public approximates the ideal of a unified systems practitioner much more closely than any ‘expert’ will ever be able to. This ideal is also civilizational because agency is fundamental to happiness. Where from here? In the systems approach we embrace the two concepts of (inadequate) perception and (persistent) deception. Both are underlain by their own world views (broad sense), which restricts inquiry (and understanding) as a result of their singular particularity. The systems approach, as a method for systemic inquiry and intervention design works best by opposing deceptive perception and perceptive deception in the strongest positive, yet equal terms. By (ideally) transcending opposing views (i.e. by understanding them in a new way) we may gain new insights and transform or improve wicked or systems situations. The question remains: How to do it? And: Where to start? The focus of Wicked Solutions is on answering these critical questions. It does so by following these principles and everything they entail. 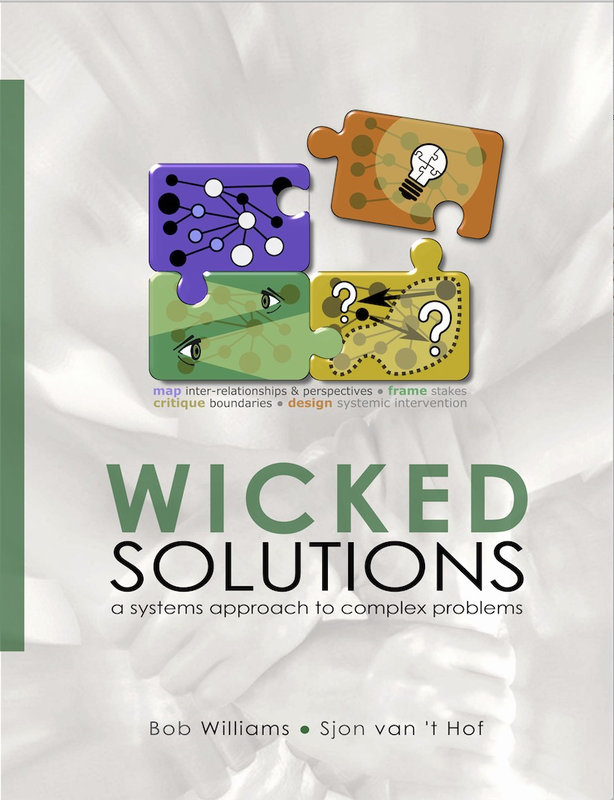 Since there is sufficient demand for Wicked Solutions we are currently working on an update, including a paper version.